B.C. 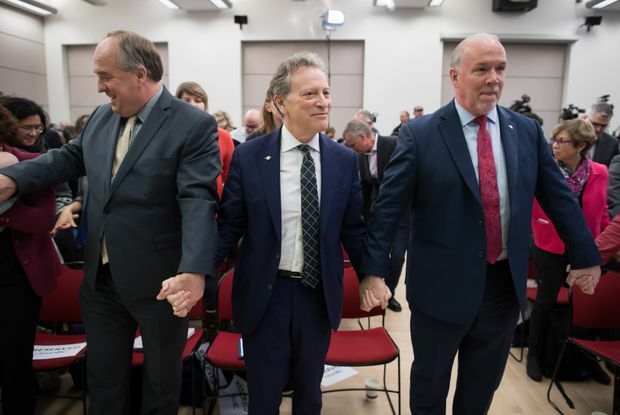 Minister of Environment and Climate Change Strategy George Heyman, centre, joins hands with Green Party Leader Andrew Weaver, left, and Premier John Horgan during a First Nations blessing before the provincial government released its CleanBC plan aimed at reducing climate pollution, in Vancouver on Dec. 5, 2018. British Columbia’s new climate action plan proposes sweeping changes that will touch every part of the economy from home heating to heavy transportation, using the province’s abundant supply of clean hydro-electric power to help shift individuals and industry off their reliance on the fossil fuels that currently make up two-thirds of B.C. 's energy consumption. Details of the rebates and tax credits aimed at spurring the change will not be released until budget day in February, but Premier John Horgan says his province is now back on track to cut greenhouse gas emissions in line with Canada’s international commitments on climate. “The challenges of climate change are clearly global, but the impacts are being felt here,” Mr. Horgan said, pointing to the province’s recent record-breaking forest fires and to communities battling both floods and drought. A decade after B.C. rolled out North America’s first broad-based carbon tax, the NDP government has committed to a string of increases to the levy. The strategy announced on Wednesday supplements that tax policy with incentives designed to accelerate a shift to a low-carbon economy. The plan aims to cut almost 19 million tonnes of GHG emissions annually from transportation, industry and buildings by the year 2030. The rising carbon tax will be used in part to help B.C. industries become global leaders in low-carbon energy and commodities. The building code will be revised to ensure new energy-efficient designs. Infrastructure to support zero-emission vehicles will be expanded. And new power transmission lines will offer heavy polluters the opportunity to convert to cleaner energy for production. That still leaves the province looking for another six million tonnes of GHGs to cut in order to meet its 2030 targets; a second phase of the plan will be rolled out over the next two years. Even with the construction of the massive Site C dam under way, the shift to electricity to power cars, homes and industry means B.C. will need additional sources of clean power. Mr. Horgan promised the plan will be affordable for families, and that the province’s climate action tax credits for low-income families will be expanded over time to take the sting out of the planned increases to the B.C. carbon tax. The provincial budget will include a major expansion of incentives designed to encourage homeowners to swap out fossil-fuel heating sources for electric heat pumps, and to improve conservation by replacing poorly sealed windows, for example, with more energy-efficient models. Industry will be offered a chance to reclaim their carbon taxes if they can meet or beat world standards for low carbon emissions within each sector, which would allow B.C. to brand its exports – from forestry and energy to concrete and minerals – with an ecofriendly label. Mr. Horgan will arrive in Montreal on Friday at the First Ministers’ meeting ready to defend his new climate action plan. He is one of a shrinking number of premiers still working with Prime Minister Justin Trudeau to put a price on carbon pollution. Ontario, Saskatchewan, Manitoba and New Brunswick have aligned against the broad-based federal carbon tax, while Alberta has frozen plans because of the lack of progress on new oil pipeline capacity. Mr. Horgan said he has already heard some push-back during a conference call with the other premiers on Monday. “There wasn’t a resounding amount of enthusiasm for carbon pricing, which is something we believe is foundational to a successful plan, so we’ll see how provinces like Ontario and Saskatchewan respond to that," he said. “I think B.C. has a solid plan; it’s great to see them being so ambitious,” federal Environment Minister Catherine McKenna said in an interview. She noted the province has the fastest growing clean-technology sector. Ms. McKenna said there are plenty of opportunities for federal backing through its infrastructure bank and other funding mechanisms to support the industrial electrification that the plan proposes. In B.C., the climate plan was met with applause by both the environmental movement and the business community. “By leveraging our low-carbon assets, including renewable hydroelectricity, British Columbia can play an out-sized role in reducing global climate impacts in high-emission jurisdictions, while building a competitive and innovative economy for British Columbians and reducing emissions here at home,” Greg D’Avignon, president of the Business Council of B.C., said in a statement.